After more than a decade of expansion cycles, Blizzard is changing their approach to World of Warcraft. Step one? Take players to a new planet. 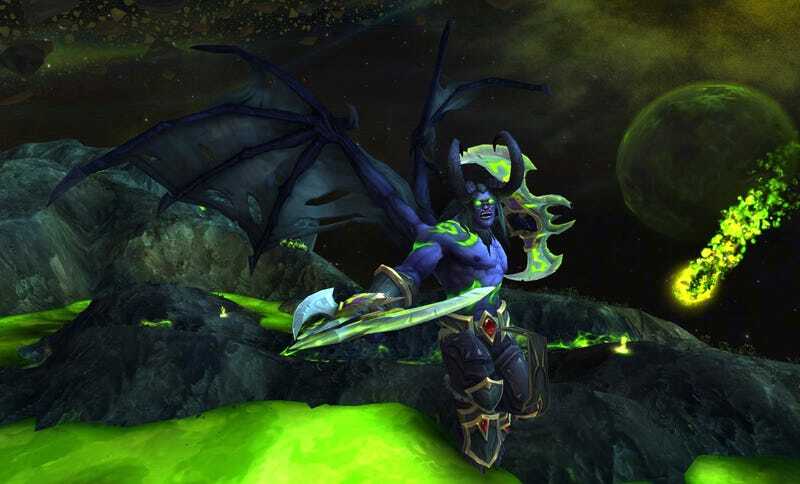 During a BlizzCon panel, World of Warcraft game director Ion Hazzikostas made a surprise announcement: the game is about to venture to a whole new planet, Draenei homeworld and demon stronghold Argus. Initially, people assumed it was a wink toward the next expansion. Nope. It’s set for an upcoming patch. It’s a big leap for a post-expansion WoW patch, but Hazzikostas said to expect a consistent stream of meaty (and less meaty) story content rather than lengthy breaks until the next expansion comes out. He added that he doesn’t think this will have a material impact on the next expansion. He doesn’t want these things to deflate expansions or the momentous feeling that surrounds them. Obviously, though, this new patch plan further blurs the lines between updates and expansions. I asked Hazzikostas what the difference is these days... aside from the part where grabbing one without forking over $40 is legally considered theft. In short, it comes down to new mega-villains and wholly new features. That said, features like Dungeon Finder originally launched in patches, and Hazzikostas said the team’s certainly not opposed to testing out new technology and systems in regular updates. Now, this all sounds nice, but if you’ve been following WoW for the past few years, you might notice a trend here: Blizzard roles out an ambitious new expansion release rate plan, and then... it doesn’t happen. For a while, it was all about releasing expansions faster. Annually, even! But now, Blizzard has shifted in a different direction. Still, it’s tough to have faith that things will go off entirely without a hitch. “I’m not gonna say we have our whole process so locked in that we’re not gonna make mistakes,” said Hazzikostas. “We’re always gonna overestimate or underestimate.”However, he added that the WoW team now has somewhere between 250 and 275 members, and everybody’s got an expansion under their belts. They’re in a strong place to keep up a healthy pace. Now, I suppose, we wait and see.